7/18/17 UPDATE: I would like to express my deepest appreciation for all the support and concern expressed to Joan and me over the past few months. Summer classes from June through August were cancelled/postponed while I recover from back surgery. I had a fusion/decompression procedure at the fourth and fifth lumbar vertebrae in my lower back on May 30th. To be honest, the pre-surgical consultation was not encouraging: my back was a mess. One doctor described my spine as a “Jenga” game! The truth is that the fourth lumbar vertebrae (the bone, not the disc) had slipped considerably and the space that allows the nerves coming out of the spinal cord the room to breathe and work uninhibited was non-existent. The result was excruciating and debilitating pain. I could not walk from the class table to the door in the studio to greet students without pain. My surgeon stated frankly that he did not think he could move the bone back in place because it had moved too far and doubted he could squeeze a “spacer” between the compressed vertebrae to open the gap and relieve the pressure on the nerves. Well, he did both! I am 7 weeks post-surgery TODAY and he procedure was a huge success by all indications. The swelling has gone down, so I am in what I would call “Phase Two” of my recovery and there seriously has been NO serious pain at any point post-surgery. There has been an annoying level of soreness, especially as I begin a somewhat more vigorous return to “normal” activities. Normal activities mean driving longer distances and getting back on the bike (tricycle) for SHORT distances. I have also been testing my stamina for longer days/night classes by taking a Japanese language class two nights a week. “Phase Two” also means paying attention to how my body reacts to being “pushed.” I was hoping to re-open in mid-July, but unfortunately, neither my short bike rides nor my Japanese classes indicate that I am ready to resume classes this month. I think September is a realistic goal and I will begin to post a tentative/limited class schedule soon. Please keep checking back for updates and mahalo for your concern and patience. We WILL be back as soon as possible! In the meantime, Here is my new blog post: LIGHT AND COLOR! Rizal Park in Intramuros, Manila at night. Amazing! 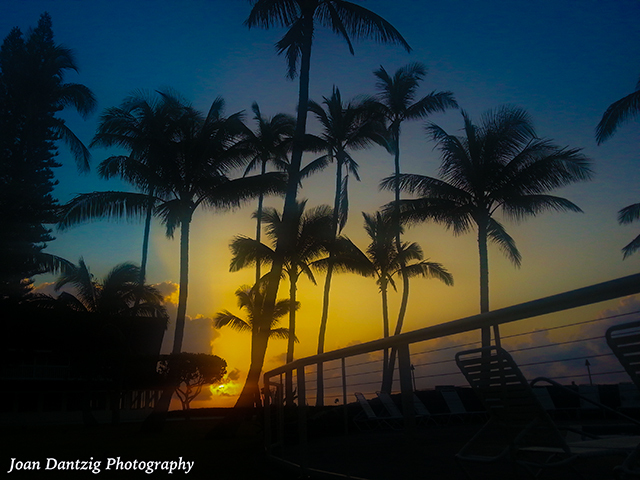 Travel Photography–Light is the defining force in photography. Photography is literally “writing with light.” We all use light—natural or artificial—to create our images. 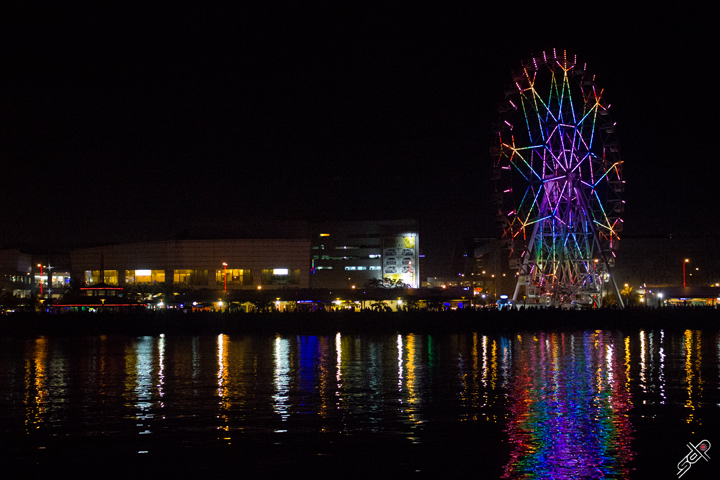 There are times, however, when the lights—and the colors they create—in your images ARE the subject. 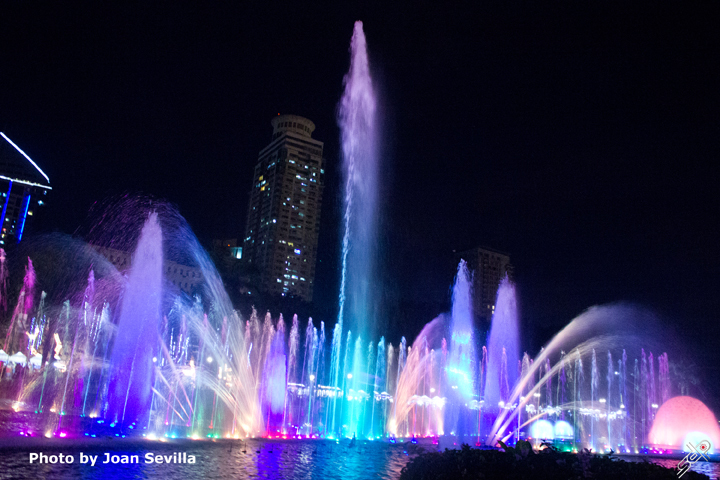 The water show in Rizal Park and the Ferris Wheel at Star City (both in Manila) and New York City from 530 Fifth Avenue are examples. Cameras: Canon T2i, Exposure f3.5, 1/25th of a second, ISO 6400 Canon T2i, Exposure f4.5, 1/80th of a second, ISO 6400 Canon 50D Exposure f3.5, 1/30th of a second, ISO 400. 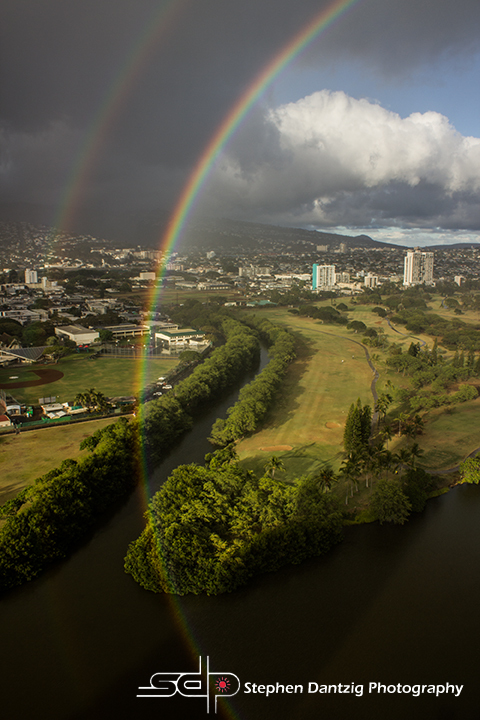 Nature can provide its own spectacular light show, such as this rainbow over the Ala Wai golf course and Manoa Valley in Honolulu Hawaii. Rainbows help remind us of what light really is and how it works. We usually “see” light as something that illuminates something else. Rarely (aside from sunrise or sunset) does the sunlight take on a “color.” We see what we call “White” light that allows the colors we see in our scene to appear “neutral” or “normal.” In fact, that “white” light is a combination of seven colors along the narrow “visible” bands of energy around us (including the invisible sound waves, ultraviolet waves, X-ray waves, infrared waves, etc.) Black, conversely, is the absence of light. 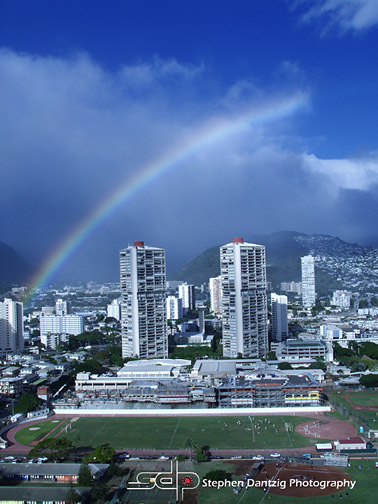 A rainbow is simply a natural prism where the droplets of water form millions of mini-prisms that break-up the light waves into individual visible bands. ….but, sometimes it gets even more amazing like this DOUBLE rainbow! Cameras: Olympus E-20 Exposure f11, 1/100th of a second, ISO 80. 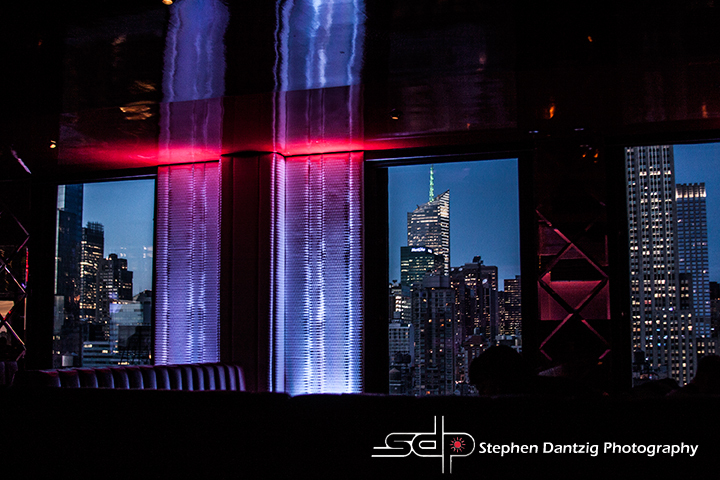 Canon T2i Exposure f10, 1/125th of a second, ISO 100. OK, Lecture over, let’s get back to photography. Here are more spectacular examples of nature’s coloring book at work, however, this time we used a little exposure trick to get the rich red-orange tones. Remember the post about creating amazing sunsets? 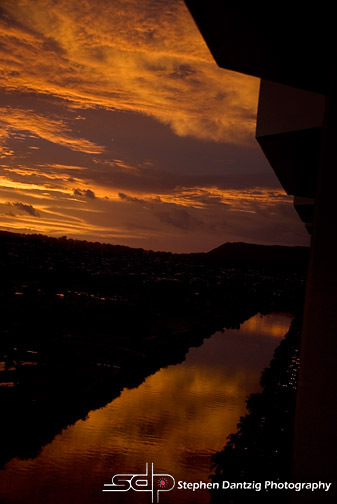 Well here is a sunrise (from the same window I shot the rainbow!) and an incredible sunset that Joan captured with her PHONE in Kapaa, Kaua’i. The key here, as discussed in the prior post, was to underexpose the image (let less light in the camera than the meter suggested.) Manual mode is the only mode to use to effectively create these types of images. The auto modes simply will not work. Daylight white balance helped add the amber hue as well. Cameras: Nikon D200 Exposure f4, 1/125th of a second, ISO 100. Samsung S7 Exposure f2.6, 1/550th of a second, ISO 80. The prior post about sunsets showed how to create interesting silhouettes by positioning trees, beach accessories and even people in the foreground while exposing (underexposing) for the background. Now, it gets trickier if you want your foreground, say a model or a friend, to be fully visible with a deep dark sunset behind them. At this point you need to add additional lights, like a flash or strobe to a the equation. Meter the scene where the flash illuminates your subjects and your backdrop will usually go dark unless you are shooting a very low power strobe or a very slow shutter speed. 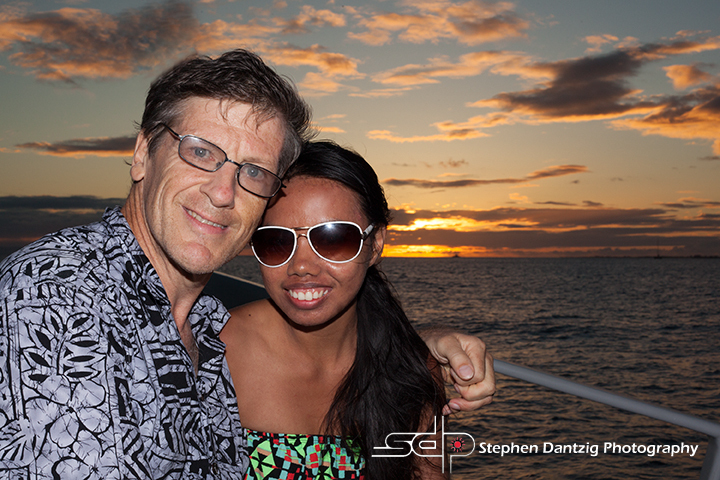 Preset your camera before giving it to someone to get the vacation images that you want! The image of Thalia on the beach was a bit more complex, but the same principle applied. We used a studio strobe to illumine Thalia which allowed the background to go dark. Cameras: Canon 5DMII Exposure f18, 1/200th of a second, ISO 400. Samsung S7 Exposure f2.6, 1/550th of a second, ISO 80. Mahalo again for your support, concern and patience. We will see you in class soon!